Youngstown, Florida , is the far right red circle northeast of Tyndall AFB (bottom red circle). 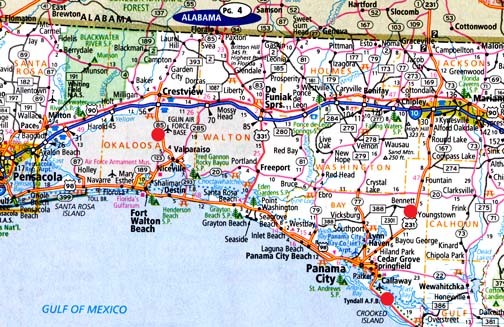 Eglin AFB is north of Fort Walton Beach (left red circle). October 21, 2007 Florida - Here are some of the Earthfiles and Dreamland viewer comments I have received since posting this report. I was told in the 1989 to 1990 time period that there was an "Earth's secret war." But the specific reason for the war and a detailing of which non-humans are fighting which non-humans and what offensive/defensive role the American military plays was not made clear. Does our American government think it has a non-human ally? And a non-human enemy? See especially below "5) Triangular Aerial Object, Other Lights, Kansas City, Missouri"